When you’re in the mood for quesadillas but want something a bit heartier than plain cheese ones, and aren’t in the mood for chicken, these bean quesadillas are the perfect solution! They require only six ingredients and are a breeze to put together, making them perfect for a busy weeknight meal or even a filling snack. They’re also a wonderful appetizer to serve at parties, as the recipe makes 32 quesadillas and can easily be doubled if more are needed. Make and enjoy them, then share the recipe love with family and friends on Facebook, Pinterest, Instagram, and Twitter. To make these, you’ll need 8 large (8-inch) flour tortillas, 1 cup of refried beans, 8 ounces of shredded Cabot Monterey Jack, Cabot Pepper Jack, or Cabot Jalapeno Lite50 Cheddar, and ¼ sliced green onions, plus Cabot Sour Cream and tomato salsa for topping, if desired. Spread each of four tortillas with ¼ cup refried beans, a quarter of cheese, and a quarter of green onions. Then top each with one of the four remaining tortillas. Place a large skillet over medium heat and, when hot, cook first quesadilla for approximately one minute, until browned on the underside. Flip over with a spatula and cook for another minute, until the second side is browned and the cheese is melted. Repeat with all four quesadillas. When ready to serve, cut each quesadilla into eight pieces and, if desired, serve topped with sour cream and/or salsa. When you’re feeling like chicken quesadillas, then you’ll want to make these Zesty Chicken and Cabot Cheddar Quesadillas. Did you know that Cabot is a cooperative of over 800 farm families who work hard to produce high quality make used to make our award-winning dairy products? 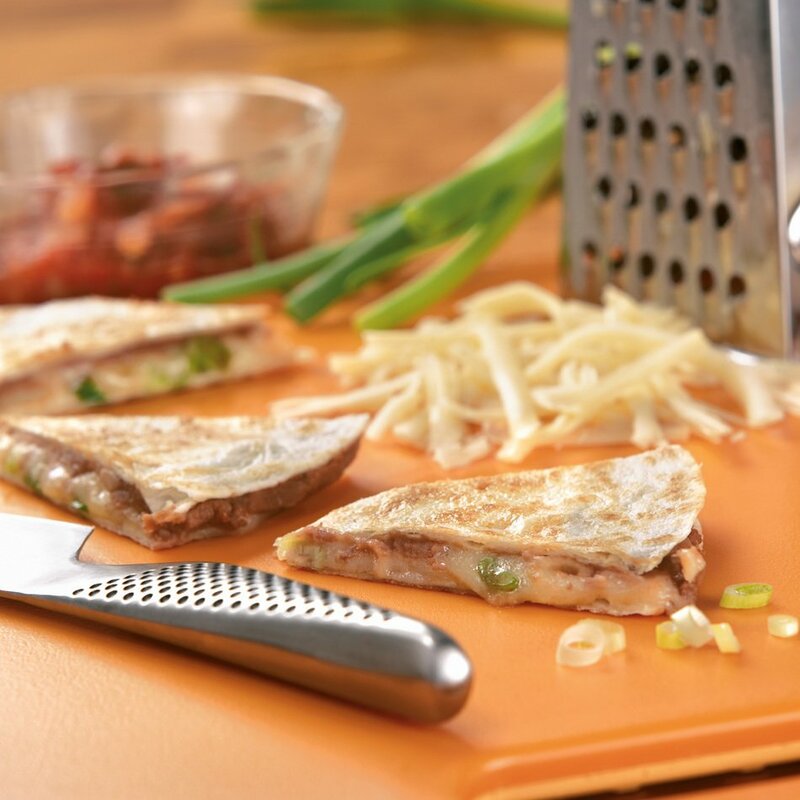 We know you’ll love our products and recipes and would love to hear your thoughts about these Cabot Cheddar Cheese and Bean Quesadillas. We’d really appreciate it if you could take a few minutes to rate and review this recipe once you’ve tried it. SPREAD four tortillas with ¼ cup refried beans each. Sprinkle each with one-fourth of cheese and one-fourth of green onions. Press remaining tortillas on top. SET large (8-inch) skillet over medium heat until hot. Place first quesadilla in skillet and cook until browned on underside, about 1 minute. Turn with spatula and cook until quesadilla is browned on second side and cheese is melted, about 1 minute longer. Repeat with remaining quesadillas (keep cooked ones warm in 200 degrees oven if not serving immediately). These quesadillas are the perfect weeknight meal! Love them!